Aug. 1965- prepared in the Bureau's Foreign Trade Division. valued at less than $500. 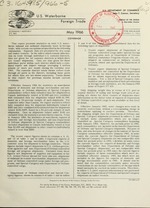 domestic and foreign merchandise laden in the U.S.
issue of Report FT 410. Annual subscription (FT 900, 930, 950, 970, 975, 985, and 986 combined) $5.00. entry shipments valued $250 and under. as U.S. exports and imports. unladen from dry cargo vessels is presented in table 2. Foreign Trade Zone without being entered as an import). the Foreign Trade Statistics Notes. or entered for immediate consumption. foreign trade areas at which the merchandise was unladen. merchandise is shipped or from which it is received. are not predetermined or fixed. Z LESS THAN 500000 POUNDS; LESS THAN 500.000 DOLLARS. EXPORTS FOR THE CUSTOMS DISTRICT. PORT ST. JOE. FLA .
ST. LOUIS, MO. . .
Z LESS THAN 500,000 POUNDS; LESS THAN 500,000 DOLLARS. IMPORTS FOR THE CUSTOMS DISTRICT. Trade area Total U.S. Total U.S.
Z LESS THAN 500.000 POUNDS. Trade area Total S. Total U.S.
Z LESS THAN 500,000 POUNDS. Department of Defense Controlled Cargo Under U.S. Foreign Aid Programs, and "Special Category"
Z LESS THAN 500 POUNDS. Trade area al U.S. All U.S. All U.S.